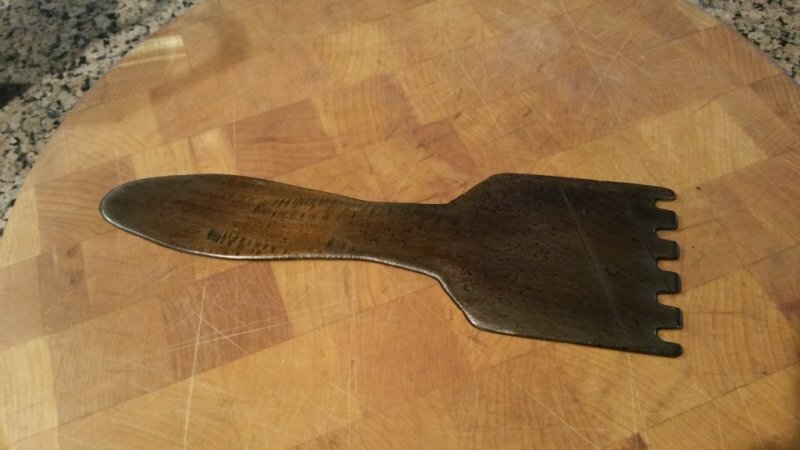 Had some spare time and a hunk of welding steel kicking around so made myself a grate cleaner/scraper. Started out as rectangular hunk of metal. To get as close of a fit to the grates as possible without measuring, I just used some spray paint to make an exact silhouette/image of the grill by laying it on the metal and giving it a light spray. Yes, I'm cleaning/burning off any paint residue very carefully before food touches the grill again. I used a jig saw with metal cutting blade to bring it down to rough dimensions and then a grinder did the rest. 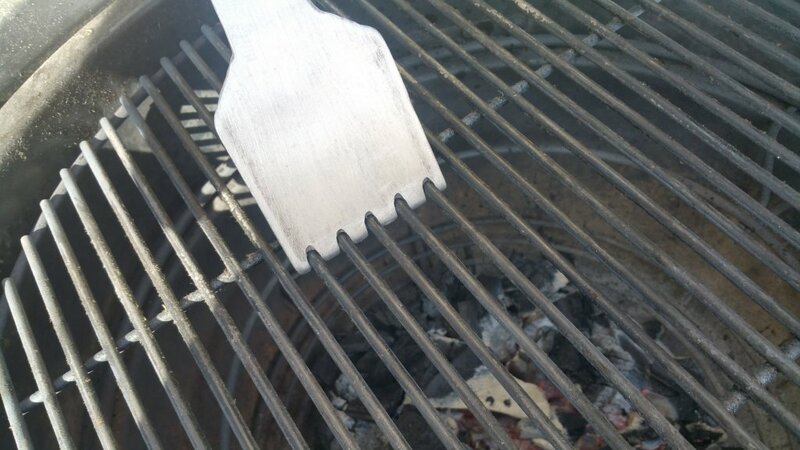 A hand file and some sand paper to clean it up and I'm giving it a good seasoning to keep the rust away right now. To keep it rust free, I'll just grease it up now and then and throw it in with some cooking to keep it well seasoned. I could get fancy and rubber coat the handle or something...but not worth the effort. 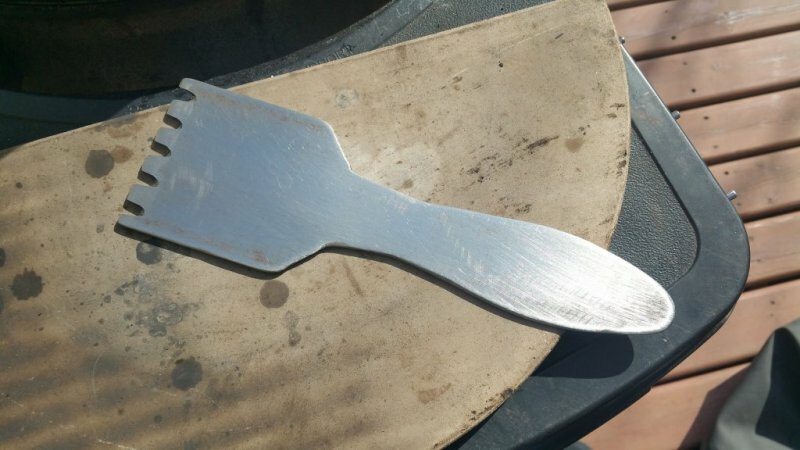 Overall, took about 1 hour of time and $3 worth of metal. I'll do some fine-tuning of the slots with a small round file if needed, but my first couple passes through when testing and it works amazingly well. Cleaned my entire grill and expander in about 20 seconds now. Of course, after finishing, I was thinking I could have just ground some slots into a paint scraper too!! Nice job. Make sure you wear some good gloves when you have that grill hot. 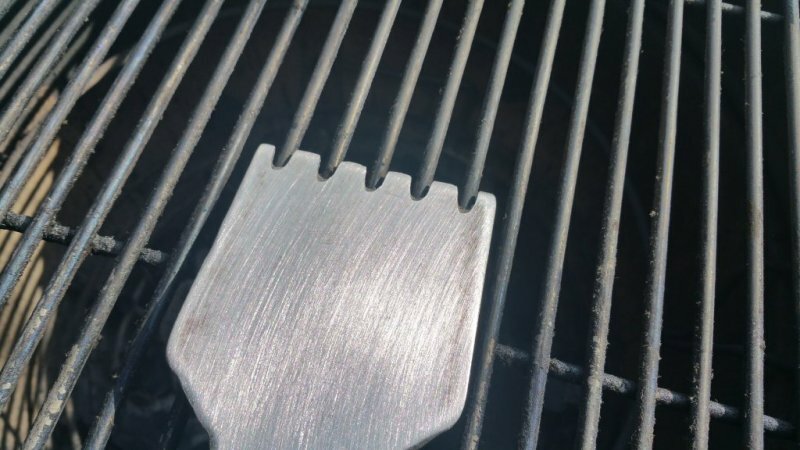 I actually sized the handle so I could also use my Lodge cast iron silicon handle holder as well...but usually have the BBQ gloves on as well when working over the hot grates! Can anyone out there with a Divide/Conquer system confirm for me that the grates are 3/16" diameter steel? oops....correction - just realized I meant 3/8", not 3/16".